In late January, J M Tohline kicked off a contest. The winner would receive an Advanced Reading Copy (ARC) of his soon-to-be-released novel, The Great Lenore. The contest was the six-word story. I thought it was a clever way to get some momentum around the book. Jordan's novel does not have the marketing budget of a Stephen King novel. Instead, he relies on word of mouth to generate interest. This contest was a way to create awareness which would lead up to big day, when readers and fans could pre-order his novel. I continued to see people posting their six-word stories on Twitter, and in a moment of inspiration I posted one. Then another. That decision set off a chain of events I had not expected. Ah, my dear friends, the choice we make alter the world we live in. To my shock, I was selected as a finalist by Jordan. The readers voted for a couple of weeks... and I won. I was elated for many reasons--but mostly I felt humility. Who were these people who voted for me? But I digress. What I did not expect was that by winning the ARC I would be forever touched by Jordan's story. I expected it to be very good. No doubt. After all, I had read his opening chapter available on his blog. So I knew the writing would be great. I knew that it would be well worth the time. What I did not expect was a masterful, clever and touching story that would keep me connected to the story long after I was done. When I met Lenore, she’d been dead for four days. Are you hooked? Yeah, I was too. I was fourteen when I read that. I was hooked. I received the ARC Friday, April 1st. I wanted to start right away, but to my horror, we had to go to a birthday party... if it wasn't my Goddaughter's 8th birthday, I would have come down with an immediate 24-hour flu. Alas, we went, and by the time we came home The Great Lenore stared at me, disappointed. I dropped on the bed, ready to pass out, but I had to start. I read the first two chapters before exhaustion took me. When I woke up, my mind needed to read the rest. It was already too late for me. With the exception of 30 minutes to drive my son back-and-forth to his guitar/piano lesson and another 13 minutes to eat lunch, I read it non-stop. I could not set it down. I had to know what happened next. Not typical for a Literary Novel? Maybe, but this novel has all the elements needed that kept me flipping pages. I was done by 5:30 PM. The story is crafted with an expert's touch. It's from the perspective of the main character, Richard. But really, the main character is the world he creates -- a world which is a web of connections, relations, lies, and decisions. The webs in The Great Lenore are indeed tangled, and the relations expertly revealed. You are tied to the story in a way that you find yourself asking "Why?" You rub your face. You hurt. You care. The reader sees the choices that are made, and the narrator even tells us throughout the story that he would regret those choices--if only he had known. The reader knows it's coming, but we are still impacted profoundly when it happens. We are still surprised by the turn that the story takes. The story has flash-backs and flash-forwards. Everything you read on the craft of writing will tell you not to do it. I suppose there's a lot of validity to the concerns. Mainly because most authors can't pull it off. 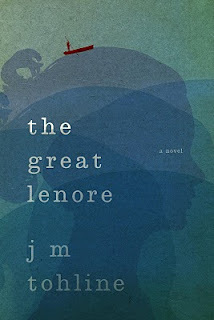 In the Great Lenore, JM Tohline pulls it off with elegance -- Jordan is an expert. You are never confused. Instead, the tapestry of the story is reveled in a way that keeps you grounded in the story world. Most books suffer because of poor character development. We hear of two-demensional characters who kill otherwise great stories. In the Great Lenore, they are not three-demensional -- Jordan takes them to the next level where the fourth dimension comes through. You feel them, you get them, and you even begin to absorb their world through their drunken stupor. Is this novel for everyone? No novel ever will be. But if you appreciate a story that will haunt you, characters that you will care for like your own, and how we are connected to the decisions we make, then this novel is for you. I recently blogged about stories and how they, like gravity, are tethered to us. I made a decision to enter a contest in January. In April, I was rewarded with a book that is tethered to me. It has added more to me -- and I would hope that all books we read we internalize to some extent. We learn from them. We become better. Take a moment and pre-order the novel. It will be released in June. Yes, you will have to wait. But it's worth the wait. Even though I have the ARC -- and it's mine so don't even think that I will give this one away -- I have pre-ordered two copies. I'm open to contest ideas for the two I've pre-ordered. Also, go to his site and enter the latest contest. You can build a book-trailer for The Great Lenore and in the process win the book and maybe even some money! Below is the synopsis from J M Tohline's site. Fight the good fight. That starts with helping a debut novelist who is talented and humble -- two attributes of A Quality Man. On December 10, 2008, a plane flying from London to Boston crashed into the Atlantic, killing every person on board. Among those pronounced dead was Lenore Montana - a rapturous young woman who was traveling home to the husband she resented and the life she despised. Upon receiving news of Lenore's death, her two-timing husband and his aristocratic family retreated to their home on Nantucket Island. Four days after the crash, Lenore sneaked onto Nantucket Island also - very much alive. Freedom! A chance to start over! Before Lenore could begin her new life, however, she wanted to attend her funeral. Interesting and thank you for the review of this fine book. It sounds intriguing. This is an outstanding review, Ara. Simply outstanding. Michael: Thank you for you comment. If you haven't already, read the fist chapter. Even with that great start, the rest of the book accelerates into great and doesn't look back. Love the review. Love Jordan's blog. Can't wait to read THE GREAT LENORE! Anne, thank you for the advice. Will look into it. More importantly, thanks for you note -- I agree with regarding Jordan's blog. Goes to show that there is a strong correlation between slid bloggers and writers.